Kama Sutra products have been created to help lovers enjoy more fulfilling emotional, spritual, and physical experiences by encouraging romantic touch, heightening of partner senses, and enhancing intimacy. This list includes our Top 10 Best Selling Kama Sutra Products that our customers have purchased. A delicate blend of chocolate, vanilla and cinnamon . 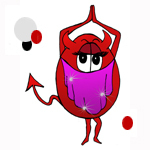 . .
Spreads a warm glow with clove's spicy allure. 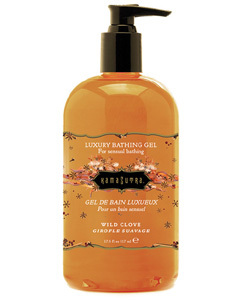 Kama Sutra Wild Clove Bathing Gel - A spicy bathing gel that leaves a glow of warmth over your body. 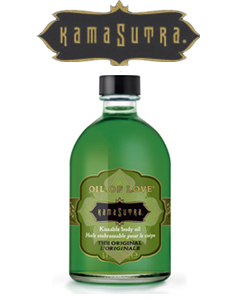 Try something spicy, a shower or bath with Kama Sutra's silky, clove scented bathing gel. Kama Sutra Wild Clove Bathing Gel invigorates the body with an exhilarating freshness and leaves a glow of warmth behind. Kama Sutra Wild Clove Bathing Gel is blended from natural vegetable extracts and Vitamin E-rich wheat germ. Kama Sutra Wild Clove Bathing Gel offers a sensual alternative to bar soap for the bath or shower. In addition, the convenient pump bottle makes these luxury gels perfect at the sink for washing hands! Lovingly crafted especially for those who enjoy bathing together. ermatologist tested. Hypoallergenic. Use externally. Fluid Oz. : 17.5. Kama Sutra Wild Clove Bathing Gelis manufactured by The Kama Sutra Company. Made in USA. Spice up your suitcase with the ideal travel companion for lovers. . .
Dust and stroke the soft feather across your lover's body. Kama Sutra Sweet Honeysuckle Honey Dust - Let passion go to your head with this sensuously smooth powder created from pure, fresh honey, one of India's most prized skin conditioners. Dust this incredibly fine powder on a lover, leaving a silky-soft glow, a delicate fragrance, and an irresistible lure. Stroke the handmade feather applicator across your body and feel its dizzying effects. Kama Sutra Sweet Honeysuckle Honey Dust has a delicate flavor of sweet pure, natural honey. Kama Sutra Sweet Honeysuckle Honey Dust comes with a handmade feather applicator enclosed with a satin pouch. Lightly dip the feather into the Honey Dust and stroke the soft feather across your lover's body. This delicate body powder will leave the skin feeling soft, smelling fragrant and tasting delicious! Dermatologist tested. Hypoallergenic. Flavor: Honey. Oz. 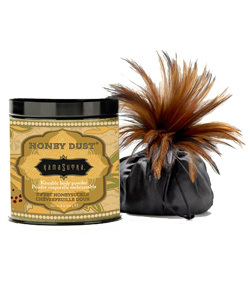 : 8 Honey Dust Body Powder is manufactured by The Kama Sutra Company. Made in USA. This trio of kissable body treats is a surprise your lover is sure to treasure.. . Seductive dark chocolate body paint with a hint of sweet raspberry. . . .
Kama Sutra Dark Chocolate Raspberry Body Paint - Brush this rich chocolate body paint onto someone you love, then treat yourselves to a sweet feast for the senses. Glass jar with twist off lid holds 2 oz. of dark chocolate body paint. Packaging includes a supple body brush to create teasing and delightful designs on your lover. Kama Sutra Dark Chocolate Raspberry Body Paint is manufactured by The Kama Sutra Company. Made in USA. Luscious sweetness plucked from a berry patch. 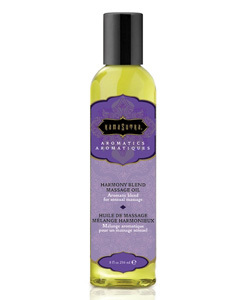 Kama Sutra Harmony Blend Aromatic Massage Oil - Rich blend of pure essential oils for soothing tired muscles and restoring harmony. Essential oils include: lavender, cardamom, rosemary, marjoram, elemi, clary sage, black pepper, clove, nutmeg, juniper and pine. Heightens arousal with a cool, tantalizing tingle . .
Kama Sutra Cooling and Tingling Intensifying Gel - [Size ~ .4 fl oz 12 ml.] Satisfy desire with sensations you've only dared to imagine. This gently stimulating gel, designed exclusively for women, intensifies female intimate response and encourages wonderfully renewing sensual enjoyment. Blended from a unique formulation of nature's most proven sexually enhancing herbal stimulants, these gels are designed to deliver optimum results, sending you blissfully to the brink and beyond. 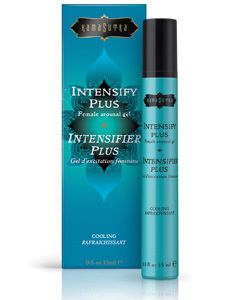 Intensify Her Pleasure. Prolong His Passion. © Copyright 2001 CEC Products, All Rights Reserved.